Who are so worthy of my love. We are now well past the midpoint of the Holy Forty Days, our Lenten battle, and this week we begin the season of the Passion. We had promised in our last newsletter to offer further Lenten encouragement, as well as to announce the launching of our new website. This letter had been prepared to send you nearly three weeks ago! One final glitch halted everything yet again, and we rather regret the timing of our letter, since Passiontide begins the time of deeper silence and a more intense contemplation of Our Lord’s sorrows and death. 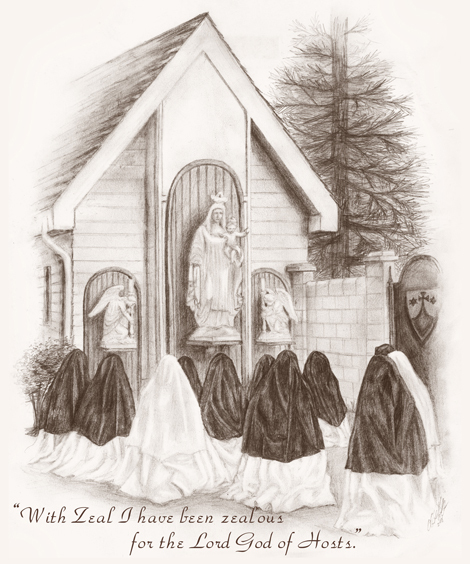 But we know the necessity of having some little contact with you at this long-delayed launch, to avoid the bit of shock some may have if they visit – – ” What happened to the Sisters of Carmel? !” We hope that our further encouragement for the Lenten path, with these additional reflections, may be of interest and aid to you for making the remainder of this holy season joyful, peaceful and abundantly fruitful for the soul. How often it is that we receive requests to know more about our life here in Carmel. Acceding to these requests, and with our Lenten theme of detachment in mind, we would like to speak briefly about the holy vows we take – and specifically, about poverty. Most people are familiar with the three vows of obedience, poverty and chastity. They are also called the evangelical counsels, because Our Lord gave these counsels for those who desire to become “perfect” (Mt 19:21). They are expressions of the three theological virtues, faith, hope, and charity – and the very perfection of the practice of these virtues. Though we, as religious, have bound ourselves to God by profession of these vows, it really belongs to all Christians to practice the evangelical counsels according to their state in life. When people hear the word “poverty,” they most often think of material poverty, or destitution. Physical/material poverty can actually be a great aid to the practice of the virtue of poverty. But just being materially poor does not mean automatically to possess the virtue. Think of the individuals you may know who habitually envy the rich, are glum over the fact that they themselves do not have what rich people have; or who do nothing but worry about gaining wealth, possessions, things – or as people these days say, stuff. These sad people think almost exclusively about money and how to amass large amounts of it. The virtue of poverty – “poverty of spirit,” – is detachment from all the goods of earth – with the intention to use them as God meant them to be used when He created them. That is, they are meant to be used as aids for us to attain Heaven, and not as things to be loved in themselves. Concupiscence of the eyes, a disorder of nature we inherited from the sin of Adam, leads us to regard things -first and foremost – while disregarding, or at least forgetting, their Creator. The virtue of poverty really serves as a foundation for all the vows, for the detachment – the holy indifference – that Religious must learn, carries to all goods of the earth: things (poverty), people (chastity), and one’s own will (the the most difficult of all – obedience). But of course, all Christians must have this detachment of their hearts from “stuff” – passing, changeable, temporal things. Without it, no one is truly free. 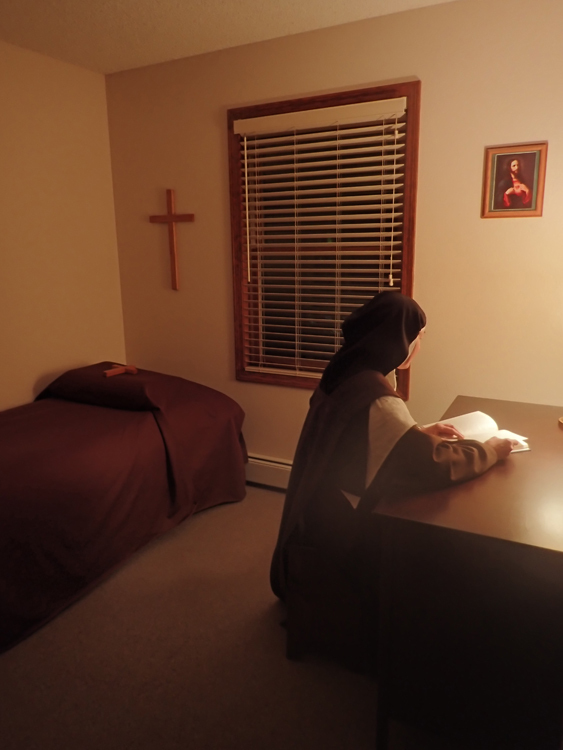 Another custom is that from time to time everyone is assigned a different cell, so that one cannot even become attached to the room where she prays, works and sleeps, nor anything in it, such as a particular lamp or desk. “Moving day” in Carmel is accomplished in the space of a few hours, since it doesn’t take very long for us to move the few things we have for our personal use. A sacrifice for many of us when entering Carmel is no longer to be free to give gifts to our loved ones. Carelessness with the tools and property of the Monastery earns us the wonderful humiliation of having to admit our negligence with a “Mea culpa”. When studying the vows, a novice once remarked how she found herself oddly and desperately attached to the pen given to her for her use: “In the world I couldn’t care less about what kind of pen I was using, but suddenly, take everything else away, and I care very much! It’s the kind that works well, and even the color of it attracts me!” The other novices agreed – and gave their own examples of how foolish they felt in being attached to some nothing-at-all! Occasionally, though, it might be something noble and good – such as a spiritual book that has been of great help, or a rosary or medal. But any attachment can hold us back. And every time we experience a pull to some object of earth, we renew the good lesson that the fault with greed lies not in the objects themselves, but in us – in poor human nature, which sometimes attaches itself to the most frivolous, really, quite stupid things. A desire to grasp – at everything…..at anything. Take all else away, and that desire will still try to find something to hold onto, however ridiculous, and when the object becomes something as trivial as a pen, we begin to realize the extent of the problem, and how much work we have to do to accomplish perfect detachment. Of course, there is no doubt that the old enemy of souls has his part in this mischief. 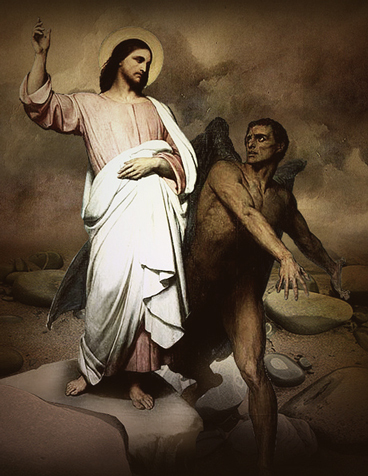 The devil knows that any silly thing will work just fine for his purpose to dissuade a soul from turning away from self and turning to God. He also has an inveterate hatred for Religious, since he knows what potential is in the life of Holy Poverty for a soul to glorify God and help save souls – by being detached and free from the things of this world, to possess God alone. the more we shall have in Heaven. Besides the obvious changes in look and layout, our “Build a Custom Rosary Feature” is the biggest change: streamlined to one page, now mobile-friendly, yet more expanded – and of course – RESPONSIVE. We are still “tweaking” since the launch yesterday. It works, but you may find some things “clunky” to use until we iron out a few more kinks. For instance you will have to do a good deal of scrolling to see the options until we get them into scroll boxes. In a few days, we should have it running more smoothly! We have added many new bead choices. See the new wood beads, especially, along with semi-precious/stone beads and crystal pearls. Very happily, we have been able to bring back both garnet and Arizona turquoise, two of the favorites that have not been available in good quality for quite a while. Black freshwater pearls called “Ravenwing” are a very special addition. 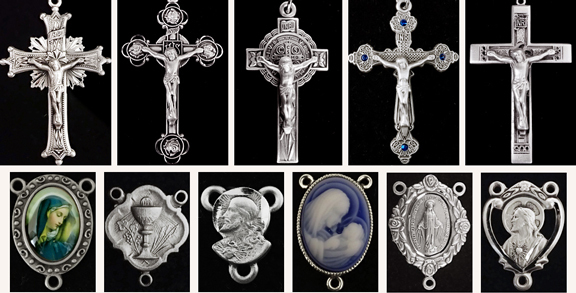 The selection of truly devotional crucifixes, centerpieces and side medals is also enlarged. You will see quite stunning new sterling pieces; new, but antique-looking, because they are traditional, elegant Christian art. Lead-free pewter pieces round off the list – many of them identical to the most popular designs in silver – more affordable, but still amazingly detailed and very sturdy. 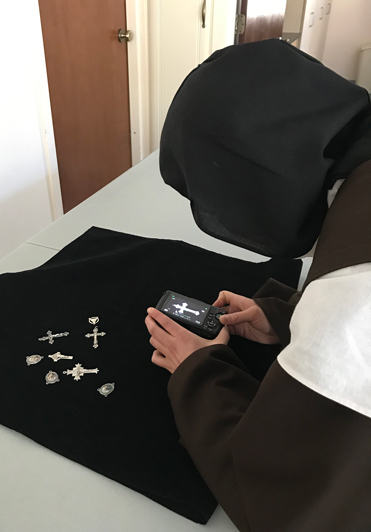 One enormous part of the website project was the retaking rescanning of pictures for all the different rosary components. Some of the pictures on our old site, especially of the beads, were about fifteen years old and more – and they sure looked it! How many times have we heard, “The crucifix is so much more beautiful than pictured on your site.” Pictures never do the actual product justice, but hopefully we’ve gotten a little bit closer to giving you an idea of what they actually look like. We have taken/edited several thousand pictures over the past months, and we send special thanks to the family of one of our Sisters, who sent us a new camera for Sister’s birthday – especially for and just in time for the project. We put it through a trial of fire! Customers are also now able to leave reviews for custom rosaries, something they were not able to do before. If you have purchased a custom rosary from us in the past and are willing to take a few moments to write a review, we would be very grateful! It will help us give a “jump start” to this new feature. 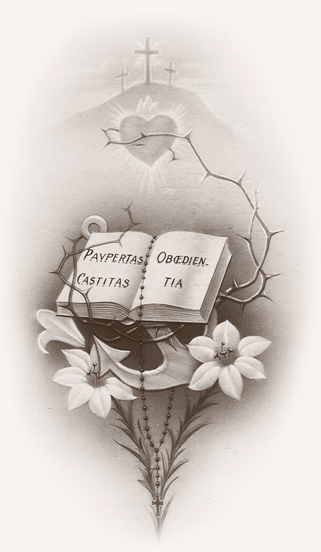 Other changes include the addition of multiple product tabs, allowing us to expand our product descriptions to provide deeper, more complete information about the items – for example, ring sizing for the devotional rings, chaplet instructions and prayers, history and explanation of symbols on some of the most ancient and treasured sacramentals in the Church, such as on the Sacred Heart Badge and the Pardon and Stations crucifixes. These product tabs are still work in progress, so if you run into tabs that have no information at all, please stand by! We might mention that there are many areas of the website that will continue to change to reflect all the tools that this powerful template now makes available and easier for us – and for you. All these changes will, we hope, give you more of the ease / information / selection you need to use your sacramentals with the greatest possible devotion, and therefore obtain from them the greatest possible efficacy. When designing the Homepage, we decided to do something a little different, and we asked one of the Sisters’ best friends from high school (who now has a mural/painting/art business) to do a few sketches for the new site. She did a beautiful image of our front courtyard (on our Homepage) and another of the front of the Monastery, the enclosure wall, with the mountain range in the background (now in our footer). We hope that you like them as much as we do! We still have work to do – such is the world of websites: ongoing work! But we hope that the improvements will make the site “usable” again! The winter storm that ripped through our area last month is no news to anyone – almost the whole country was touched by the same storm in some way! Even our native Colorado Sisters said they don’t remember anything quite like it, with wind gusts of 85 miles per hour in our area, the strength of a Category 2 hurricane! We had trouble opening several of our doors because of the high winds blowing and heavy, wet snow weighting against them. 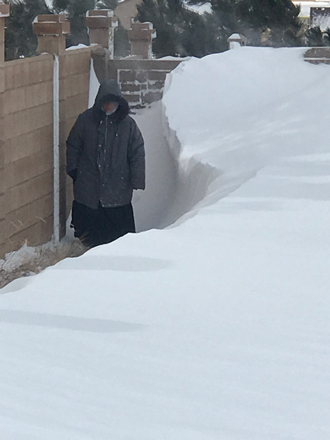 We spent March 13th taking turns getting bundled up to face the severe blizzard to unburden trees nearest the house of their heavy load of snow… and also to take the dogs out! Zelie and Meika usually LOVE to race out their little doggie door to go outside; but that day, we were hard pressed to push them out the door. One time that day, Meika stepped out, only immediately to do a 180 back inside for the warm-and-dry. Parts of our enclosure here were completely bare, while other parts of the yard were buried in 4′ to 6′ drifts, as you will see in the photos. Some drifts went right up and over the enclosure walls! And a few drifts are still melting today, nearly a month later. Thanks be to God, we experienced no damage here, other than losing a few tree branches. Our prayers were with those who lost their lives in the storm, three here in Colorado, along with the thousands stranded on the roads, and the thousands without power for several days. Very near to us in Black Forest, four or five days later, people were still without power. We heard from a friend who lives there that power lines In Black Forest fell, due to high winds toppling dead trees remaining from the fire there 5½ years ago. Obviously, the weather did further delay completion of our modular building. But final inspections are due this next week, and we hope to be able to add a few wind-protecting trees as time and funds permit. Inclement weather or not, it was not lost upon us that our two large and long-term projects, the new website and even more so the new building, were coming close to a happy conclusion during March, the month dedicated to St. Joseph. We have always looked to him, as did our seraphic Mother St. Teresa, as the provider and protector of our Carmel. Right from the start, both of these projects were placed under his truly loving protection. On March 19th, St. Joseph’s Feast Day, it is our custom here to have a procession in his honor. 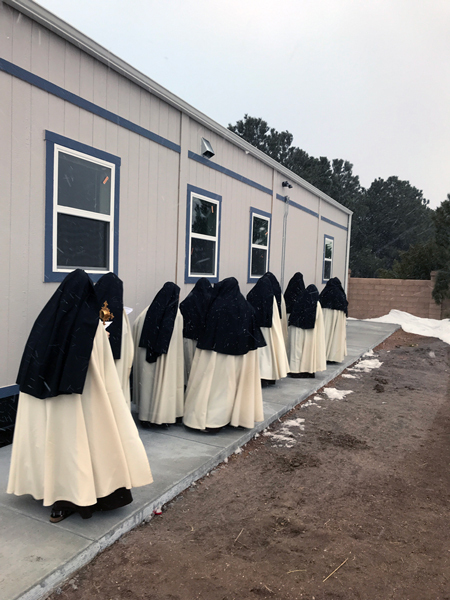 Sisters process around the new building on St. Joseph’s Feast day, carrying his relic. 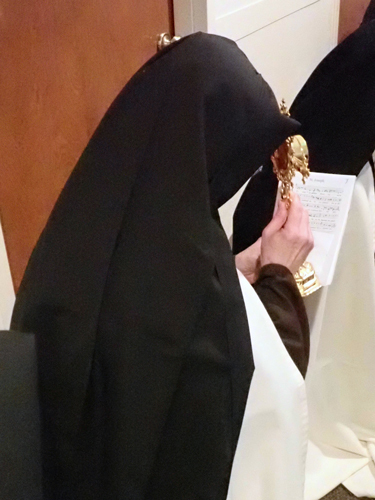 After the final prayers, each Sister venerates the relic of St. Joseph. 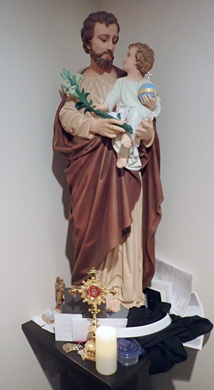 St. Joseph with all of the items/petitions placed at his feet. 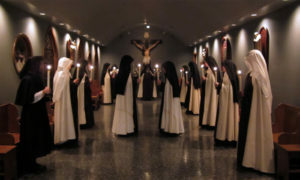 Each Sister carries with her in procession an item that represents a certain request or petition we are making to the Saint. Last year, we carried a hammer to represent the proposed modular office building, and one of our simple business cards to symbolize the website transformation. This year, as we processed around the enclosure, we carried in our hearts thanksgiving for the constant help and the favors granted – as well as the petition to make good use of them to God’s glory. This time of fasting has opened to us the gates of paradise. We may be glorified with the Lord.